Organic Oriental Wasabi Mustard Microgreen | Gardens Alive! A deliciously bold addition to sandwiches or salads, Wasabi is a powerhouse of protein and a great source of vitamins A, B6 and C. It is also packed with calcium, iron, magnesium, phosphorus, potassium and zinc. 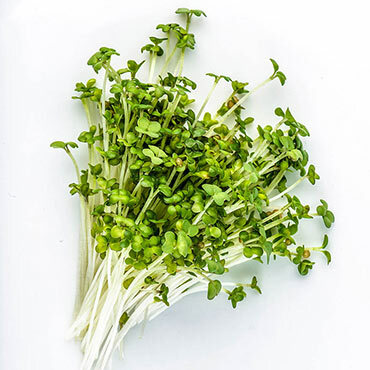 It's a charming little microgreen with green, heart-shaped leaves over thin, crisp stalks. They taste familiar at first, with the raw, crisp freshness microgreens are known for, and then comes the heat! You'll quickly taste the horseradish spiciness that wasabi root is known for. Absolutely delectable. Try with our Microgreens Growing Kit, which contains everything you need to get started except for the seeds. 10-12 days to maturity. Seed Count: 1 oz. per packet.